March 7th, 2013 was the date commemorating one year anniversary on the navy’s blast of the Gureombi Rock despite people’s fierce opposition to it. 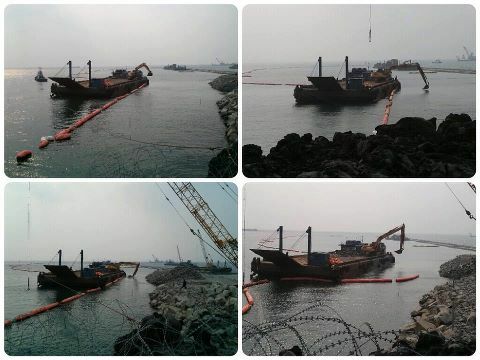 The people’s struggles to save the Gureombi Rock, the absolute preservation coastal area of the Gangjeong village, reached one of their highest points during the time when the blast was continued for two months since March 7, 2012. Photo by Lee Wooki, March 6, 2012/ Just one day before the start of the blast, tension was already being formed as people made efforts to stop the explosive-loaded trucks from a gun powder factory. For more photos by Lee Wooki who reminds the atmosphere of March 6, 2012, see here. A recollection video on March 7, 2012, here. On March 2, 2013, there was a nationwide citizens’ rally in the Gangjeong village, which commemorated it. See the days’ photos and video, here. The below is a small recollection and is focused on the oppression on international activists. It might not fully include all the happenings. Please pardon for any missing in advance. It was because as a villager has laid bare his heart, “Gangjeong is the Gureombi. Gureombi is the Gangjeong.” The one-body andesite that extends about 1 km from the east and west of the coast is very rare in the dominantly basalt-formed Jeju Island that was created by volcanic activity. With its soft and smooth rock surface of which the forms are various, the fresh abundant spring water among those provides the habitats for diverse endangered species, such as red-feet crabs, Jejusaebaengii(Jeju fresh water shrimp), and narrow mouth toad. For villagers, it has been not only a life ground for making living, but for maintaining community spirit and meditation on life. It is a site where one realizes that it is the very site that one has looked for somehow: The wholeness of life. Such common feeling and idea on the Gureombi Rock was one motivation that could strengthen people’s unity against the Government’s merciless destruction of the Gureombi Rock, the nature, the peace, and ourselves somehow. 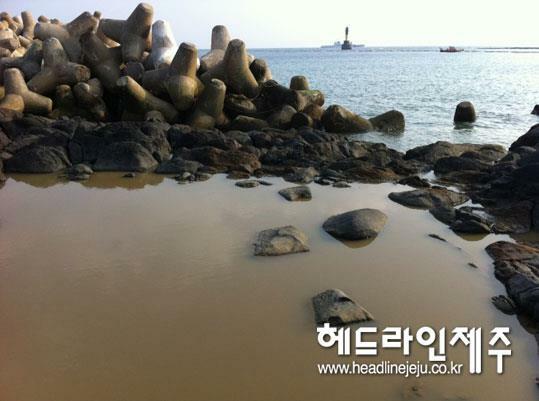 Headline Jeju, March 9, 2012 (Original source: Gangjeong Village Association) / Water became soon contaminated after the Navy’s first blasting on Gureombi rock. On the day, the woman who took this photo in the Metboori, the east part of the base project area, was also arrested though released soon. The underground water underneath the Gureombi rock is highly guessed by the villagers to be connected with the Gangjeong stream that feeds 70% of the citizens in the Seogwipo City (the southern part of the Island). Beside that, the Gangjeong Sea is known as the cleanest and most beautiful sea throughout the Jeju Island, being the only UNESCO-designated soft coral habitats and one of the most frequent sites of the Indo-Pacific bottle nose dolphins, the IUCN-listed species. Prof. Yang Yoon-Mo who had lived in the Gureombi Rock for three years until the navy forcefully set up its fence on Sept. 2, 2011, in an effort to stop the naval base project, was being imprisoned for the 3rd time and was in the hunger strike. As the blast started on March 7, he hit his 28th fast day. He stopped even water and salt since the day until his release on March 20. The blast was unjustly forced through political fraud. For the two months, the navy blasted about 10% of the Gureombi Rock: East and west parts of it to build the caisson production area and shipment site. On Feb. 14,, the technical verification committee on the Civilian-Military Complex for Tour Beauty issued its last report and acknowledged the fact that: “If the current execution design for the Jeju naval base construction is [continued to be] applied as it is, the original government pledge that it would build a civilian-military complex port for 150,000 ton cruise passenger ships cannot be kept. However, Lee Myung-Bak the President, declared that he would build the Jeju naval base construction without any explanation on it. Then the Prime Minster who had written in his facebook that the civilian-military complex port for tour beauty is impossible to be realized suddenly changed his attitude and started to push the construction. The Minister of Prime Office held the related government institutes’ measure meeting joined by the National Police Agency and Coast Guard etc. to support the enforcement of construction declared by the President, followed by assertion that there is no problem in the base construction, one-sidedly accepting the simulation report presented by the Ministry of National Defense on [Feb.] 23. Then it enforced the blast of the Gureombi Rock with a rush on [March] 7, . 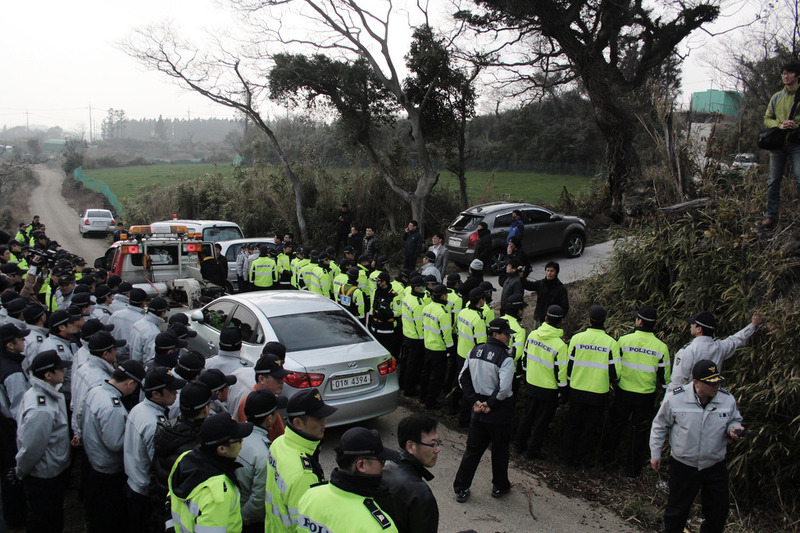 It was such an unjust and unreasonable process even Woo Keun-Min, the Island governor and members of the ruling conservative Saenuri Party opposed. See here and here. A second 4.3: The human rights violation reached its highest point during the blast. For 28 days alone since the start of the blast on the Gureombi Rock, more than 90 people were arrested while 20 people, swooned, were carried in ambulance for the police violence. Still the village sirens for protest rang everyday. For more, see here. On March 9, the 3rd day of people’s war against the blast alone, 30 people including Angie Zelter, Nobel Peace nominee, Catholic and Protestant missionaries were violently arrested. Four people were carried to hospital. See the Dungree video in the below. On the day alone, the siren rang six times. Following the arrest of Rev. Lee Jeong-Hoon and Jesuit priest, Kim Jeong-Wook on March 11 ( imprisoned on the day and released on April 4), Dr. Song Kang-Ho was eventually imprisoned for his fierce struggle on April 3 (released on Sept. 28). As for the navy and police’s abuse of their power, Mr. Lim Ho-Young was another victim. Prof. Yang Yoon-Mo who was arrested and imprisoned since Jan. 30 could be released only on March 20, after more than 42 days’ prison fast. Fr. Mun Jeong-Hyeon who fell from the 7 m tetra pod during his protest to the reckless coast guard on April 6 would suffer from the back and waist pain for long time despite his unexpected quick release from the hospital. The people entered into the Gureombi Rock, risking high sea waves, security-filled fences, dangerously piled up tetra pods, and police and navy threat. The people chained themselves to vehicles to stop the explosive cars, eventually being taken away of all their cars. The cars were returned back only six months later. The people connected their arms with pipes to stop the explosive cars, only to be met by police’s merciless breaking down of those pipes with hammer (March 19) and electric saw (April 16). With the start of the blast, about 700 police personnel from the main land arrived the Jeju, reminding the 4.3 incident period from 1947 to 1954 when the central Rhee Syngman government, a U.S. puppet then, dispatched military, para-military, and police of the main land to mercilessly suppress the people’s uprising in the Island. Oppressions on international activists were never precedent. 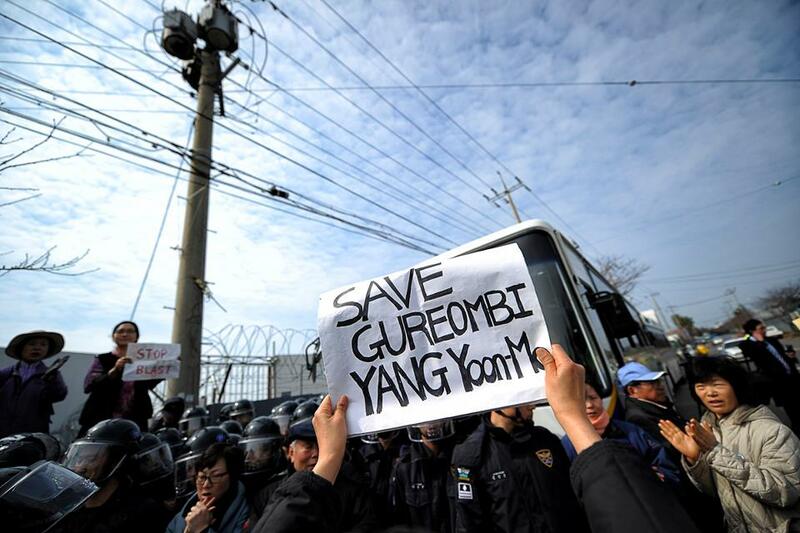 On Feb. 26, 6 Koreans and 10 international peace activists including seven Global Network members, such as Bruce Gagnon and Dave Webb were arrested while they crawled under the razor wire on the Gureombi Rock. See the report on it here. After the blast of the Gureombi Rock started, the actions by international activists and oppression on them were remarkable. Angie Zelter who entered the Gureombi Rock on Feb. 26 was eventually arrested on March 9 when she entered the fence. The Daelim company thugs’ violence on her during the process was one of the subjects of people’s criticism on March 10 Press Conference. You can see her own account on March 9 arrest, after her release here. It was the time that oppression on international activists started in earnest. Benjamin Monnet who first came to Gangjeong in May 2011 and had stayed for months eventually got injunction order on March 14 after his arrest on March 12 (See here). Angie Zelter who was arrested again on March 12 got exit order on March 15, as well. See the people’s statement in relation to it, here and Angie Zelter’s here. To be coincident, Elliot Adams (Past President of the VfP), Mike Hastie, Tarak Kauff, three members of the Veterans for Peace, US, were violently and inhumanly denied entries on March 14 while their intention was to ‘stand in solidarity with the villagers.’ See here. 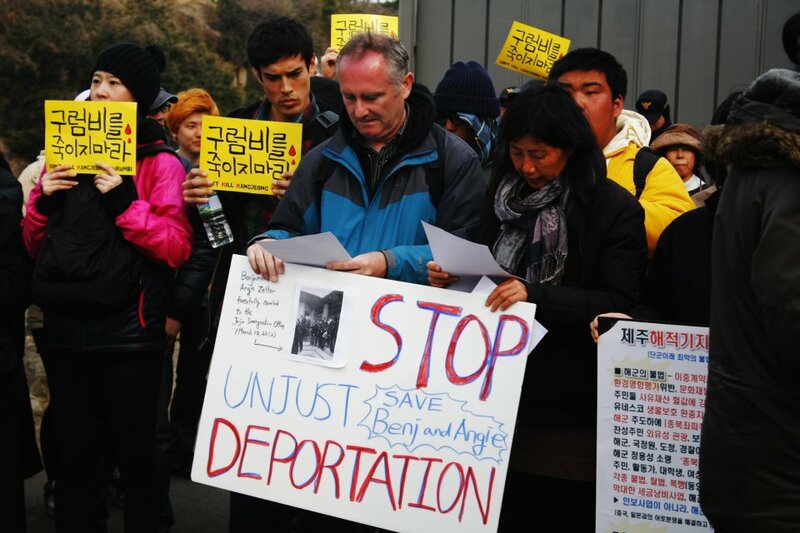 Bruce Gagnon states that ‘the South Korean authorities had a photo of each of them in their hands and told them they would not be allowed to enter Jeju Island.’ You can see the report here . And the statement by the VfP, here. 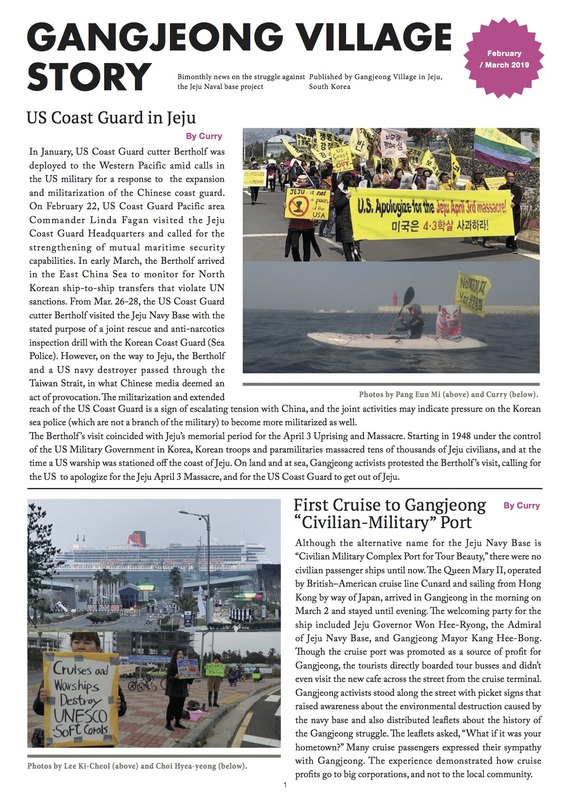 Remarkably, it was for the first time that the members of the VfP, United States, were denied entry into South Korea, signifying that the naval base project is a highly sensitive matter for the authorities of the United States and South Korean governments. It was not only those three VfP members. 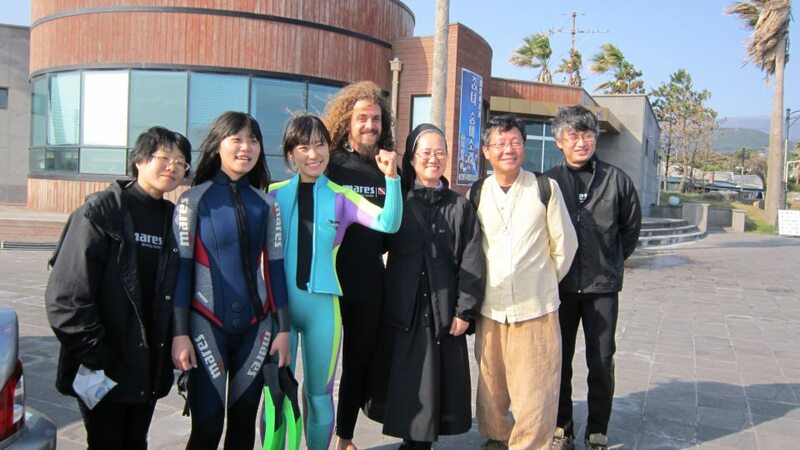 During the two months of March and April, 5 people from Okinawa and Japan were denied entries. They are Nakamura Sugae and her daughter(March 27), Ryuji Yagi ( March 31), Umisedo Yutaka (Okinawa, April 2), Tomiyama Masahiro (Okinawa, April 6). From August 26, 2011 to Oct. 16, 2012, the total people who were denied entries to Korea, in relation to the Jeju naval base issue, were at least 20, while the total numbers are 24. It is because the last three people were repeatedly denied entries during the WCC period, Sept. 6 to 15, 2012. In June, even an international Catholic priest was threatened to be deported. See here. For the whole matters on the deportation, see here. Though, not deported, harasses on international activists were remarkable. Paco Booyah reported on the incident of March 24, 2012. See here. The oppression on internationals especially during the time of the blast on the Gureombi Rock signified the growing international solidarity to the threat of the United States and South Korean authorities, otherwise. 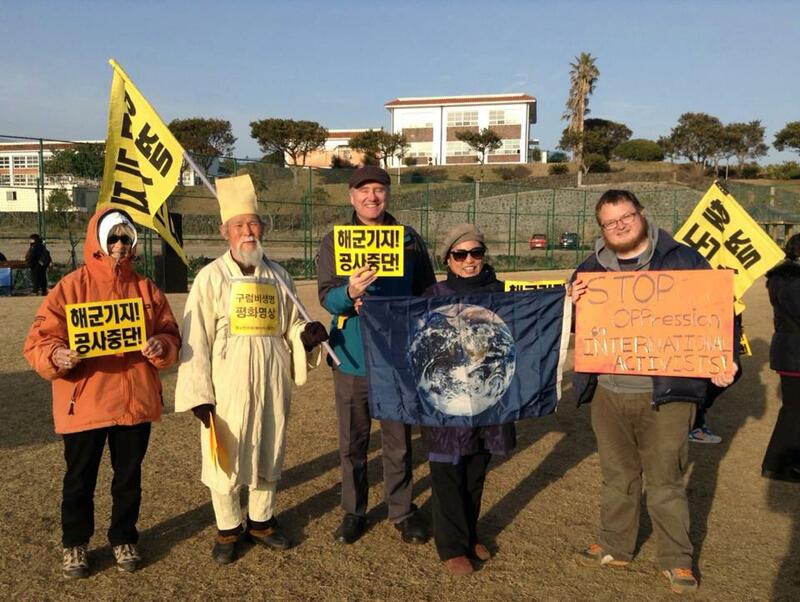 The International peace activists have often gotten unjust disposal from the South Korean authorities for their peaceful protests against the war-base building in the Jeju. We so thank them and hope to share with you the urgency to protect international activists who fight to save the Peace Island. It was the sign that the village international team held on March 2 upon the 1st year anniversary of the blast on the Gureombi Rock. The oppression on internationals were in earnest with the start of the blast on the Gureombi Rock on March 7, 2012. Source: Angie Zelter in Gangjeong on March 8, 2012, 104th International Women’s Day. 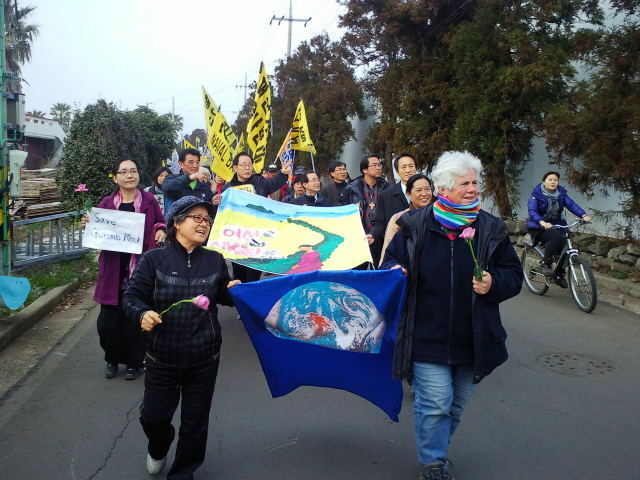 She held the Earth flagwith Jeong Young-Hee, chairwoman of the Village Women’s Committee to Stop the Naval Base. Here in the UK I have just started a new direct action campaign to try to stop the replacement of our nuclear weapon system and persuade the Government to give them up. It is linked with your struggle as we must all in our own ways stop our Governments from wasting resources and lives on war preparations. I send you much love and solidarity and will never forget you. Please send my greetings to all those whose knew me and whose emails I do not have. The below video (by Yang Dong-Kyu) was taken for the 4.3-memorizing event in Jeju, just before Angie Zelter’s leave of the village where she stayed for a month. It is always great to remember all the valuable experience of international solidarity and to strengthen it. We pay our deep gratitude to all the international friends who have shown friendship and solidarity despite serious hardships that they had to suffer from, continuously reminding us that the universe and we are one.